Nyala — Protests and marches continued in and around Kalma camp for the displaced near the South Darfur capital of Nyala ahead of the planned visit by Sudan's President Omar Al Bashir tomorrow. 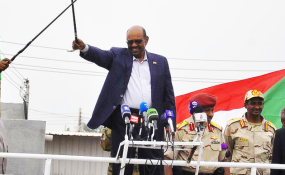 Al Bashir addressed a mass public rally in Nyala today, flanked by South Darfur Governor Adam El Faki and Maj. Gen. Muhammad Hamdan Hamiti, commander of the Rapid Support Forces (RSF) militia. Similarly to his address in El Geneina in West Darfur on Tuesday, Al Bashir spoke of the return of the displaced to their villages of origin, and encouraged the state to develop formal housing for those who are eligible. He reiterated that the state is in the process of extending security and collecting and legalising weapons and vehicles. Al Bashir's official itinerary will take him to the vast Kalma camp tomorrow, as well as the Gireida camps and Shataya locality. However, unconfirmed reports circulating on social media suggest that that presidential road show might avoid Kalma camp 'for security reasons' and divert to Bilel locality instead. Representatives of the displaced in South Darfur have been unambiguous in their rejection of Al Bashir's visit. Sheikh Ali Abdelrahman El Tahir, the head of camp Kalma which has seen three days of protests, told Radio Dabanga that "President Al Bashir is not welcome in the South Darfur camps for the displaced," he said. "Al Bashir has murdered our fathers and mothers, taken our homes and our money, and raped our women. We don't want to see his face here." Sheikh El Tahir said that in Kalma camp, "if parents were to call their son Bashir, we would drive them from the camp. That is how strong the feelings are here. "Al Bashir asks us for forgiveness but we will never forgive him - he should rather go to the International Criminal Court in The Hague to answer for his crimes and plead for forgiveness there." The sheikh alleges that "the governor of North Darfur distributed 20 weapons to Bilel locality, instructing the inhabitants to come and fire them (in celebration) at Kalma when Al Bashir visits, but the Commissioner of Bilel refused. Our message to Al Bashir is clear: you are not welcome here." Sheikh El Tahir ridiculed Al Bashir's planned visit to Sataya locality: "All the people of Shataya are now here in Kalam camp, more than 1,000 of them, and their Sheikh is standing right here behind me. The people Al Bashir will encounter in Shataya today are settlers from all over Sudan, not the true inhabitants. The sheikh told Radio Dabanga that the peaceful protests against Al Bashir's visit will continue at the camp "for as long as necessary". He appealed to Unamid to put pressure on Al Bashir not to visit Kalma camp, and appealed to political parties in Sudan to show solidarity with the displaced. "We hold Al Bashir personally responsible for the consequences of any incidents that might occur if he insists on attempting to visit the camp," Sheikh El Tahir concluded. Yagoub Abdallah Furi, the Coordinator of the Darfuri Camps, confirmed to Radio Dabanga that "the demonstrations will continue (see video) with the same force on Friday in conjunction with the announced visit of Al Bashir so that both local and international opinion will know how what Kalma is talking about". Sheikh Abdelrazeg Yousif Suleiman, the secretary of information and spokesman for displaced persons coordination said that "Al Bashir's second visit to Darfur today is a continuation of the genocide through which he wants to send false reports about the displaced persons to the Security Council and America, but we will not allow him to do so". Displaced inhabitants of the camps at Zalingei in Central Darfur also gathered in mass protest in solidarity with other Darfur displaced (see pictures below). In West Darfur, President Omar Al Bashir confirmed the support of the President of the Republic for the return of displaced persons and enabling them to return voluntarily to their places of origin. On Thursday in a public speech in Foro Baranga, Al Bashir directed West Darfur Government to create favourable conditions for the return of the displaced persons, provide necessary services, housing and planning for those who want to stay in the city.